I finally went into to this new gallery, but unfortunately a dark room with glass cabinets and lots of spotlights is not camera friendly, so I don’t have many photos. Tinder sourced & pumili tirrina (basket) made By Vicki-Laine maikutena Green. 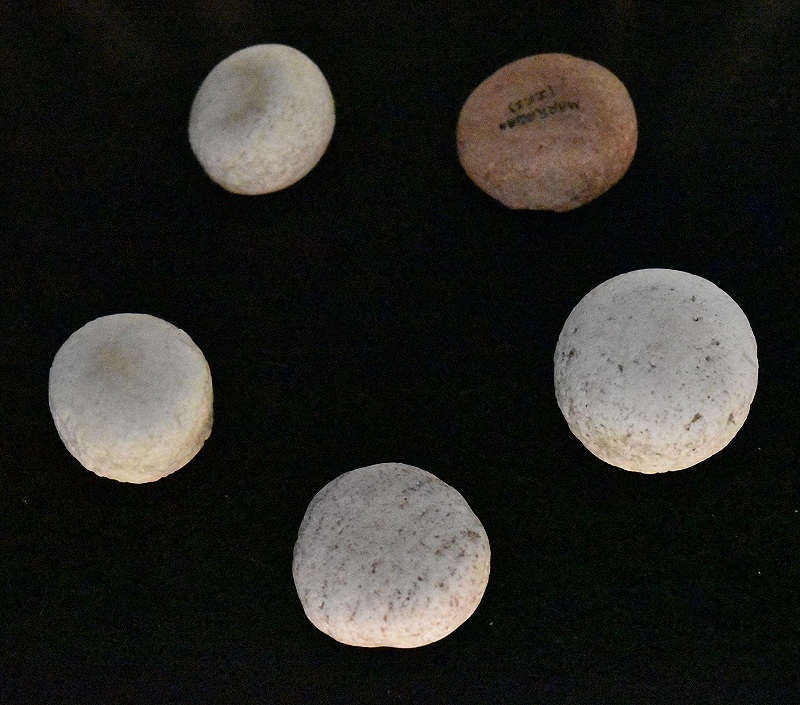 French explorers recorded finding baskets containing the materials for making fire by percussion. 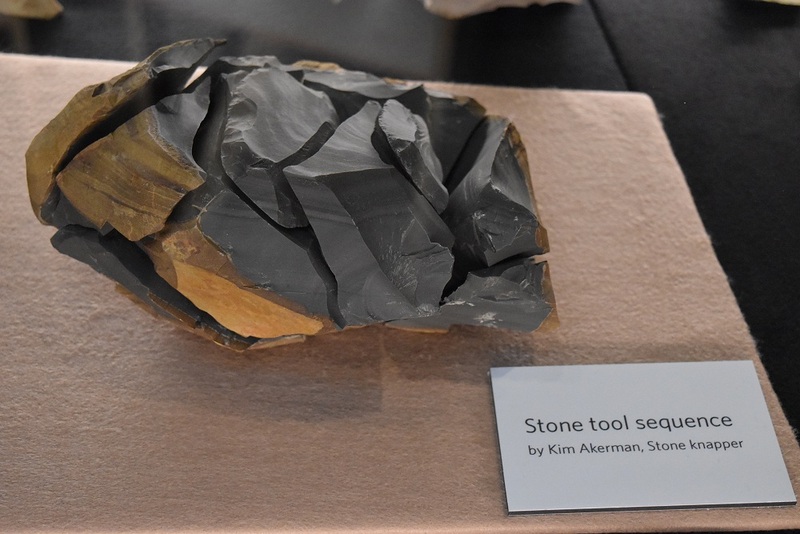 This kit contains materials that were likely to be used, including suitable stones to create the spark and dry material from the inside of the grass stems to ignite the flame. See, lots of reflections and lights from behind make for bad photos. This basket is recorded as having been made in 1841 on Flinders Island. 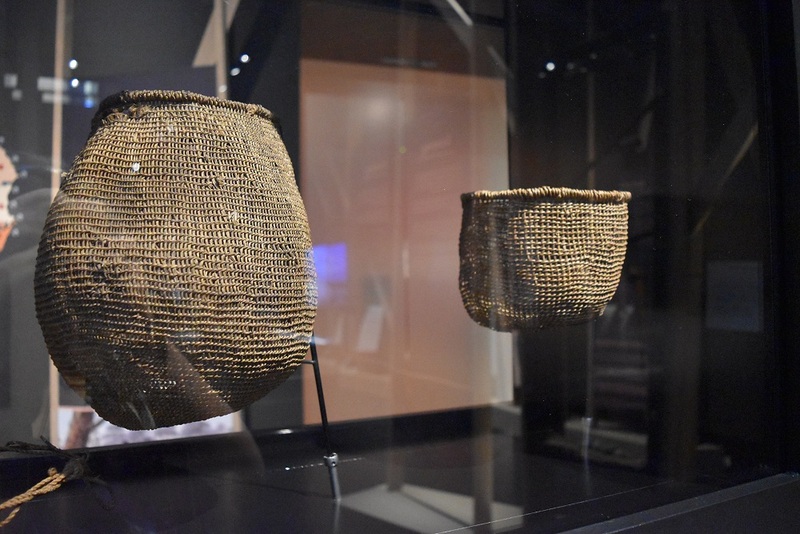 It shows evidence of extensive use and may be one of the few surviving baskets in existence that were made for personal use, rather than for trade. I didn’t record the label for the smaller basket as I didn’t realise I had a photo of it, but it has its own post on the First Tasmanians: Our Story Facebook page. 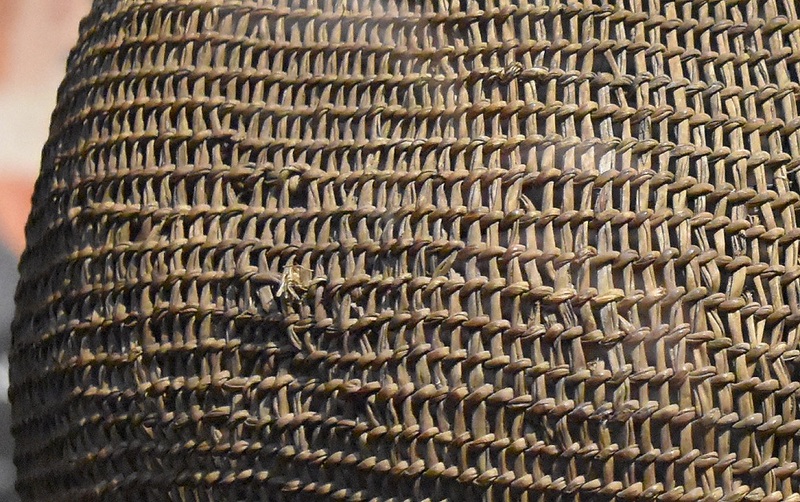 Close-up of the larger basket because I like the pattern/texture. 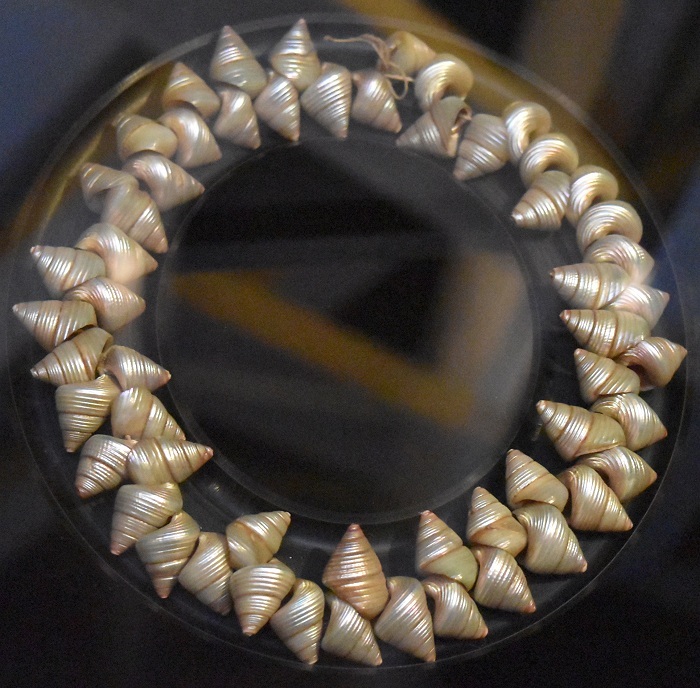 This is the necklace referred to in the aforementioned FB post. 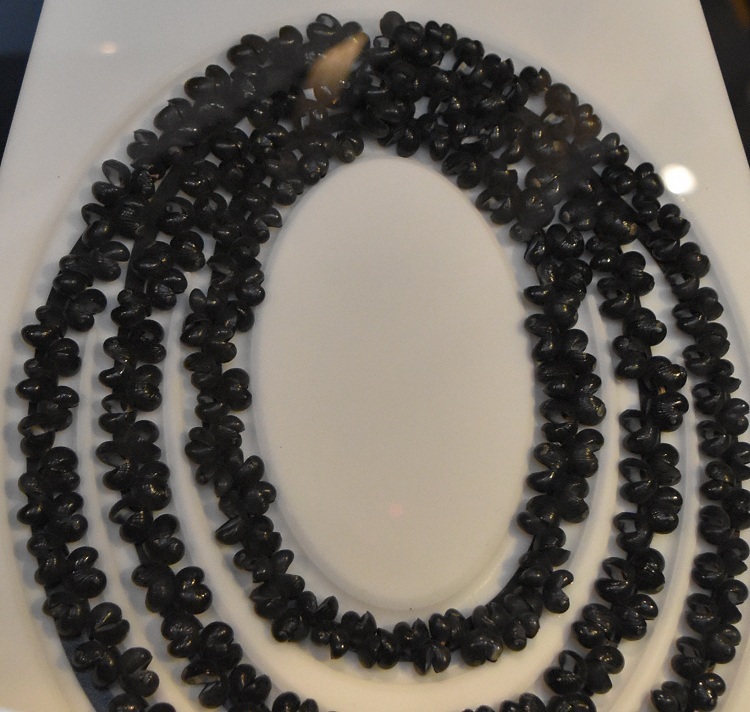 As you can see, overhead lights make photographing the necklaces too difficult (and I have some better photos anyway). 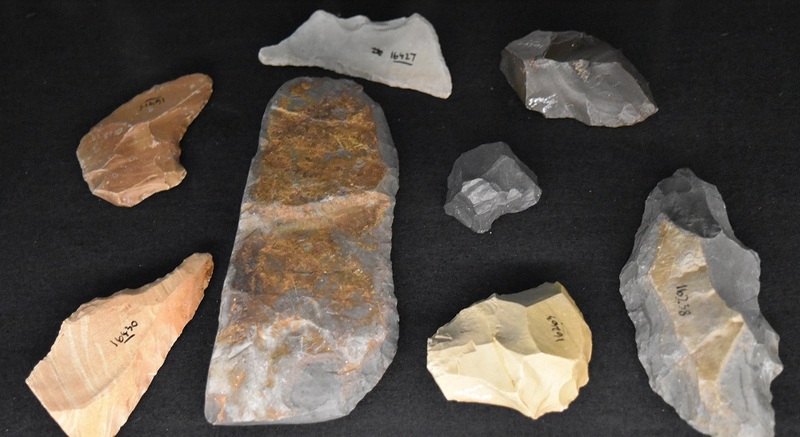 Stone tools, from Seymour on the East Coat. 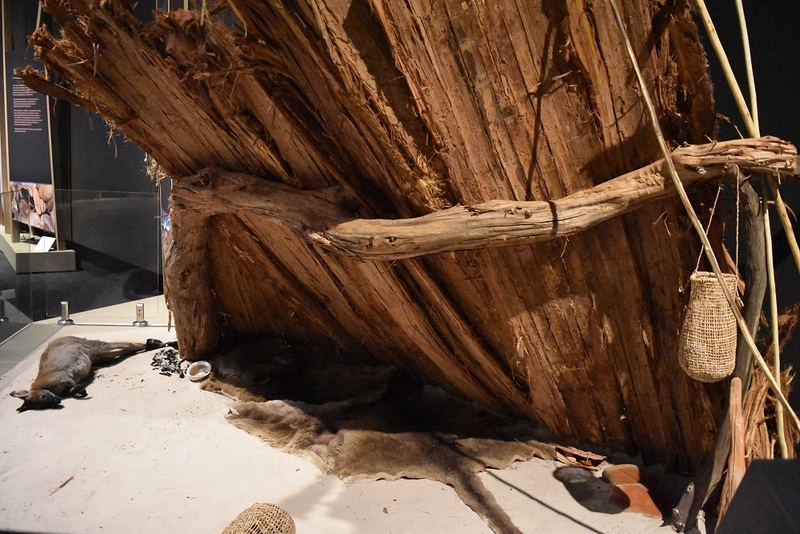 This scene represents a camp with a bark windbreak (leprena) of the type made by the nations of the east coast of Tasmania. Windbreaks are a simple form of shelter, which is all that was necessary in the milder environment of the east coast. People here relied for much of the year on coastal resources, but because of the openness of the country could travel longer distances in a day to hunt and forage. Windbreaks such as this were a simple and efficient way of making a comfortable, temporary camp. Windbreaks could have three main parts: a layer of woven bark sheets, supported by a light timer framework, which may have rested against a stump, fallen tree limb or large rock. 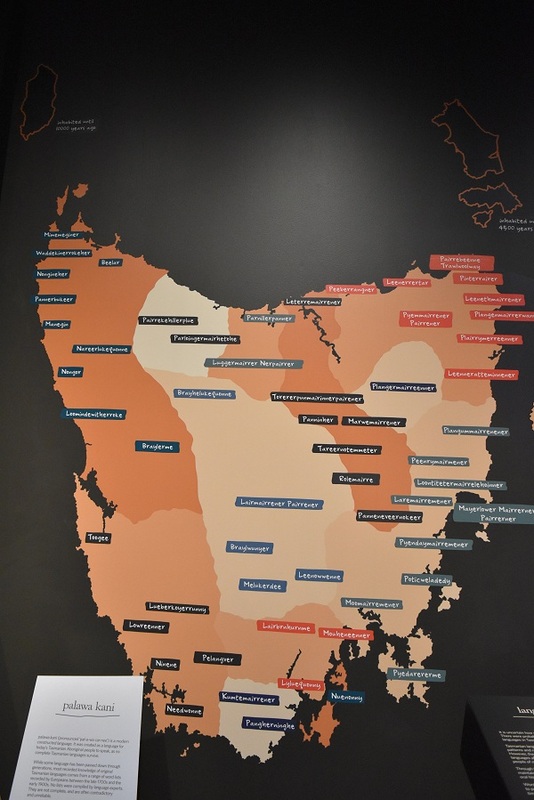 Tasmania’s west coast is a harsh environment, with rough country, high rainfall, low temperatures and strong windows. Because of these conditions, the people of western nations moved around less frequently, and built more permanent shelters (gardown). These could be large enough to house extended families of twenty or more, including their fires. Groups of as many as seventeen huts formed relatively permanent “villages”. The villages were location close to water and food sources, such as rocky coastlines or inland lagoons. A high narrow opening facing away from the prevailing wind served as a door, window and chimney. 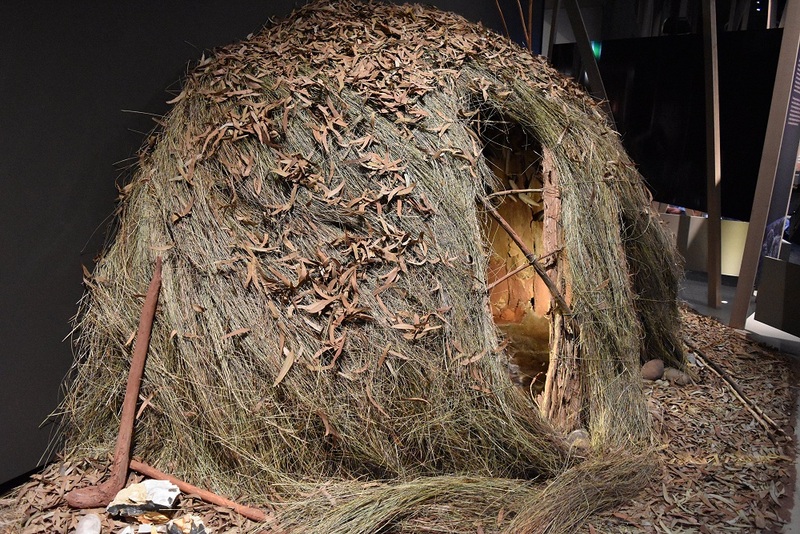 Huts were thatched with grass and were often lined with paperbark and feathers, making them well insulated from the cold. Charcoal drawings on back decorated the walls. Construction started by digging a hollow in the ground three to five metres in diameter. Next each pole was positioned and one end driven into the ground. The pole was bent to form an arch and the other end buried. Both ends of each pole were reinforced with stones. This formed the framework of the hut. The frame was then covered with long strips of back, Grass thatch was laid over this. Designed By InkHive. © 2019 Journal. All Rights Reserved.